5th & 6th Floors, 52-54 Southwark Street, London SE1 1UN. Well-known Australian cricket broadcaster, Tim Lane, and Elliot Cartledge have put together a worthy, if perhaps grim given their subject’s shocking death, book on the times of English-born but dual-nationality cricketer and writer, Peter Roebuck. Roebuck was known as a decent county cricketer with Somerset and perhaps unlucky not to have been elevated to the England side. Roebuck was very much one of the Somerset stalwarts during their heyday in the early 1980s despite the presence of international superstars, Ian Botham, Viv Richards and Joel Garner. Most readers will be aware of the way in which this era ended and it is a necessary part of Chasing Shadows. Roebuck has always been remembered as a complex person and much was made of his writing of the foreword to David Frith’s subject on cricketing suicides, By His Own Hand. Roebuck mentioned in this piece that people saw him as a potential candidate to join the grim list of Frith’s excellent book but he does, at the end, conclude that it would not happen. 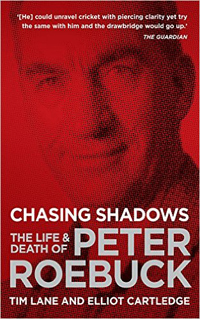 Chasing Shadows is a story – and a very fair one: the authors seem very much to be in the pro-Roebuck camp – which allows its readers to make their own minds up about his personality and about his demise in a Cape Town hotel in late 2011. The feeling was that it was suicide but Lane and Cartledge very eloquently explore deeper avenues and, unfortunately, the truth is unlikely to be revealed given that, partly, the police have far too much crime to contend with. It appears that the investigation was perhaps not thorough enough. I am impressed by some of the interviewees used by the author. All are well-respected in various cricketing circles and, on seeing their names, I was confident that a fair appraisal of Roebuck would be given and that does, to me, come over. One such person was another integral part of the Somerset team of the Roebuck era, Vic Marks. A genial personality but with a very savvy cricketing mind, Vic, as one of Roebuck’s closest friends, is an ideal person to give a balanced view. The Roebuck family have also given a greater understanding of their son. Others interviewed include David Frith and Jonathan Agnew. Roebuck’s forthright approach with a pen was much admired by many but controversy followed him about. Some ventures perhaps inevitably led to scurrilous accusations, some of his writings may not have helped him but Casting Shadows is not only fair but illuminating. By its very nature, some of the book is gloomy but it has been very well researched, is equally well written and, due to Roebuck’s own privacy, is probably the most thorough book written about this player and writer. One wonders what legacy Roebuck has left but Casting Shadows has given an excellent insight into the former Somerset cricketer whilst his sad demise has opened up a few questions.